In the media as in a variety of books aimed at the general public, Abraham Lincoln’s name has often been paired with public figures who have been identified or have self-identified as modern-day freethinkers. This essay offers comments on the relationship between Lincoln and the American freethought tradition, with a final focus on Thomas Paine, all of which are considered in the context of the 2006 Lincoln bicentennial, the New Atheism movement, and the increase in the number of American “nones.” Some historiographical shifts and communication strategies used by freethinkers are also emphasized. The purpose of the essay is to provide some insight into the renewal of interest for freethought in the United States. 1By modern-day freethinkers I designate a complex constituency, at once distinct from the category “unaffiliated,” or “nones,” a term used in the 2008 American Religious Identification Survey, to refer to people who do not identify with a specific group or faith when it comes to religion, and broader than the category “non-believers,” which gather people who say that they do not believe in a personal, institutionally defined god, or a higher power. Freethinkers include a wide range of people who challenge established belief, question traditional faith and reject supernatural claims on the basis of reason. Many are atheists, but they also include agnostics, skeptics, or deists. Other words for self-designation are rationalists, humanists, secularists, naturalists, or “brights,” a term coined in 2003 to avoid the A-word and thus encourage American atheists to come out of the closet. From 2007 and 2012, according to the Pew Research Center, the religiously unaffiliated increased from 15% to 20% of all U.S. adults, spurring worries among clergy, but also scholarly interest in secularism and secularity. The label “freethinkers” is used by Barry Kosmin and Ariela Keysar in Secularism & Secularity, published in 2006, to refer to “a subgroup of those who have consciously rejected religion,” whose specificity is “apostasy or a willingness to give up a previously held religious identity” (20). 2Religion is still part of Lincoln’s enigma, and his faith or lack of faith remains a subject of contention among biographers and scholars. The controversy endures, but an agreement seems to have been reached among historians. As Richard W. Fox put it in 2006, the now widely shared view is “that the non-church-member Lincoln maintained a secular perspective throughout his life, even as, during the war, he found psychic solace in the Scriptures and accommodated the religious cravings of his fellow citizens by framing some of his speeches in biblical language.” Fox also noted that in the years nearing the bicentennial of Lincoln, a wave of biographies had laid new emphasis on Lincoln’s religion. These biographies include Allen Guelzo’s Abraham Lincoln: Redeemer President and Richard Cawardine’s Lincoln: A Life of Purpose and Power. 3Arguably the new emphasis on the centrality of Lincoln’s religious quest to his personal life and political views matched a broader historiographical shift, which had seen historians pay greater attention to the significance of religion in general. By the same token, the revival of scholarly interest in American skepticism among historians of Early America, which has been apparent for the last fifteen years, has fostered a renewed interest in Lincoln’s doubts about Christianity. Given the currently contested nature of Lincoln’s personal faith, it is remarkable that Guelzo concluded that Lincoln “could not come the whole way to belief. He did not know [Guelzo’s emphasis] if there was a God who had made him, deliberately, with conscious interest and good will, like a father […]” (463), hence implying that Lincoln was an agnostic. LC-USZC4-2542, Library of Congress Prints and Photographs Division, Washington, D.C.
4Conversely, closer attention to Lincoln’s early disdain for institutionalized Christianity and his curiosity for Thomas Paine and comte de Volney, acknowledged by Lincoln’s law partner and early biographer, William Herndon, has contributed to the new scholarship on freethought in the antebellum era. Thomas Paine, of course, was the author of The Age of Reason, an anti-Christian deistic pamphlet published in 1794–1795, while Constantin-François Volney published Ruines, ou Méditations sur les révolutions des empires, first published in French in 1791, and in English in 1792. Both works are central to the American freethought tradition, and had also appealed to Thomas Jefferson to the point that the future president elect secretly co-authored, possibly in 1799, while he was campaigning against the Federalists, the third translation of Volney’s work, which was published in Paris in 1802. Lincoln read Paine and Volney in the 1830s, a decade when, as historian Christopher Grasso has argued in an essay on religious doubt, religious skepticism had become “an important force” and “a viable possibility” (507–08). 5In Lincoln in American Memory, Jefferson scholar Merill D. Peterson observed that after his assassination, Lincoln was not only preempted by Protestant ministers, who “from the hour of his death” portrayed “the Martyr president as an exemplary Christian,” but also by freethinkers, spiritualists, and Jews (218). The dissenting tradition of Lincoln as a lifelong freethinker, Peterson recalled, had its apostles in Herndon, and, in the late nineteenth century, in the self-designated “Great Agnostic,” Robert G. Ingersoll, and also in John R. Remsburg, author of an essay entitled Abraham Lincoln: Was he a Christian? published in 1893 by the Truth Seeker Company. For Peterson, however, “there was little basis for maintaining that Lincoln was a freethinker in religion” (227). Typically, freethought did not fare well in Peterson’s account. The historian shrugs off the validity of “this line of thinking” by pointing out its sterility, “even dishonesty,” and, in a passage on Joseph Lewis—author of an address delivered at a banquet of the Freethinkers’ Society of New York in 1924 entitled “Abraham Lincoln, a Freethinker”—he suggests that Lewis had fabricated quotations and made up stories about Lincoln (227). Lewis was an admirer of Lincoln, but also of Paine, and a promoter of freethought works in the first half of the twentieth century. The founder of the Freethought Press Association, he held the title of president of Freethinkers of America his entire life. 6In 2004, in the well-received Freethinkers: A History of American Secularism, independent scholar and journalist Susan Jacoby “rescued” the freethought tradition “from the indifference of posterity,” to use the New York Times’s appreciative terms (Wills). The author was then speaking out on behalf of the growing number of “nones,” a term which had not yet been popularized. Jacoby referred to “the congregation of the unchurched,” i.e. those who do not claim any particular religious affiliation, but are nonetheless, or should be—it was Jacoby’s argument that they were not—protected by the Freedom of Religion Clause of the U.S. Constitution (Jacoby 6). The book sought to revamp the use of the word “freethinker,” “a lovely word,” Jacoby wrote (4). Jacoby starts with Tom Paine, who she argues, somewhat ahistorically, “was the first American freethinker to be labeled an atheist, denigrated both before and after his death, and deprived of his proper place in American history” (5). After a chapter on anticlericalism, abolitionism, and feminism, which focuses on William Lloyd Garrison and Lucretia Mott, she goes all the way to Lincoln, to whom she devotes a whole chapter, entitled “The Belief and Unbelief of Abraham Lincoln.” Lincoln is portrayed not as an unbeliever, but as a skeptic, and Jacoby, “with due respect to theologians who see Lincoln as a profound religious thinker,” exposes the “attempt to Christianize a president who had never been a member of a Christian church” (120, 122). She then discusses Darwin and Ingersoll, before turning in the last chapters to more obscure figures, who lived after the “golden age of freethought” (151), and fought antievolutionism, censorship, school prayer, or opposition to birth control and atheistic communism. 7Jacoby did not create this genealogy, but fortified its pervasiveness. The lineage was further enhanced by online lists of “great quotations”—many of them surviving today on otherwise obsolete webpages—which have linked Lincoln back to Benjamin Franklin, Thomas Jefferson, Tom Paine, and even John Adams, but also Elizabeth Cady Stanton, the lead author of The Woman’s Bible (1895-1898). Lincoln is similarly made out to be related to Mark Twain, Emerson, Whitman, John Dewey, Clarence Darrow, the lawyer who defended the teaching of evolution in the 1925 Scopes Monkey Trial, Paul Kurtz, founder of the Council of Secular Humanism, Christopher Hitchens, author of God Poisons Everything (2006), to name but a few. Lincoln has also served the needs of atheists in books which were published in the wake of the New Atheism movement, such as The Quotable Atheist: Ammunition for Non-Believers, Political Junkies, Gadflies, and Those Generally Hell-Bound, by Jack Huberman (2006), and The Atheist’s Bible: An Illustrious Collection of Irreverent Thoughts, by Joan Konner (2007). 8The genealogy often extends outside the United States to include people such as Charles Darwin (Lincoln’s twin brother so to speak, since they were born on the same day), Albert Einstein, Simone de Beauvoir, the British biologist Richard Dawkins, author of The God Delusion (2006), or the Dalai Lama, and in some cases moves beyond modern times to trace its origins in antiquity (Cicero is then quoted), the whole point being to bring to the fore the universality of freethought. Some, such as Kurtz, Hitchens, and Dawkins were or are self-declared humanists or atheists, while others, who died long ago, are still very much alive in American collective memory, not necessarily as people who criticized, were indifferent to, or even derided traditional religion, but as agents of social change and progress who set examples for the future. 9As David Blight remarked in Our Lincoln: New Perspectives on Lincoln and his World, edited by Eric Foner, Lincoln remains “infinitely malleable.” In Blight’s words, “Lincoln could do it all, and we still make him do so. He can serve as everyone’s aid or tool in one struggle over historical memory after another” (270). Blight focused on the way Republicans had misused Lincoln since the late 1990s in order to persuade voters that “they were still the party of Lincoln” (271). Other scholars had pointed in the same direction when dealing with matters of faith. In the 2006 Slate article, Fox predicted that “[t]he 2009 commemorations [would] surely coincide with attempts to induct Lincoln into the ongoing American cultural tug-of-war by forcing him onto one side or the other [of the secular-religious boundary line] (Fox). And they did. In 2009, Free Inquiry, the magazine published by the Council of Secular Humanism, ran a piece entitled “Lincoln’s Religious Skepticism,” in which the author concluded that Lincoln’s “accomplishments are an example of what a wise and skilled political leader can achieve without exhorting fellow citizens to follow a religious path” (47). At about the same time the evangelical magazine Christianity Today published an interview with Ronald C. White, author of a biography of Lincoln aimed at the general public, in which the historian, also an ordained Presbyterian minister, emphasized the centrality of the Christian faith to Lincoln. In the interview, Lincoln was described as a man engaged with profound questions of the Christian faith. As the author put it, “Lincoln is a pearl that has been hidden from the Christian community and obscured. We’ve focused on almost everything else in the Lincoln Bicentennial, but not much on that” (Trafton). 10At stake was the definition of American identity and the endless debate on whether the U.S. was a Christian or secular nation. In Michael Kammen’s words, the United States is “a nation of mythmakers,” prone to “manipulat[e] the past in order to create or to shape the present” or “to justify and validate a present desire” (283–84). The historian insists that “there is something peculiarly American about not perceiving properly the distinctions between history and myth” (298). As Fox eloquently writes, Lincoln “can gather disciples on both sides,” but the “real Lincoln remains a straddler, too religious for most secularists but too fatalistic for most religionists” (Fox). 11The iconic Lincoln has become a standard with which countless public figures have been compared. Parallels have been carried with other U.S. presidents, in particular Thomas Jefferson and more recently Barack Obama, both sharing with Lincoln the notions that religion has no monopoly on morality and should remain a matter of choice, and that church and state should be kept separated. Lincoln can also be related to Paine, who died in the same year Lincoln was born. 12Many aspects connect Lincoln, the father of the “second American Revolution,” and Paine, author of Common Sense, the pamphlet which played a decisive role in the development of the American revolution of 1776. Both were advocates of human freedom, both sought, to use Lincoln’s words in his 1861 Message to Congress, to “elevate the condition of men.” Both were at once nationalists and universalists, both were disinterested servants of the people, both came from humble origins. Like Paine’s, Lincoln’s image has reflected the metamorphoses of American society. Like Paine, Lincoln contributed to the modern conception of an American “civil religion.” In Our Lincoln, Cawardine contends that Lincoln’s religion must not be taken “too lightly” and that religion “shaped his vision and drove his politics” (225). The same can be said about Paine. Unlike Lincoln, however, whose faith remains hard to pin down, Paine publicized his deistic views. Yet, both were drawn to Enlightenment rationalist criticism, and while they lived in different times and their quests went different paths, neither were atheists. They were men who acknowledged the existence of God, although not in an orthodox way. Paine was a man of the triumphant Enlightenment, who confidently sought to institutionalize deism in the mid-1790s. At the same time, he promoted a subjective kind of faith, one that might have appealed to Lincoln’s introspective mind. “My own mind is my own church,” Paine forcefully wrote in The Age of Reason (22). 13Moreover, both were emancipators who have become objects of a fascination that is only fostered by their political and religious ambiguity. Paine can hardly be reclaimed by Christians, but his deism is one marked by the need to believe in a creator and an afterlife. Yet just as Lincoln has been used by the left and the right, and co-opted by interest groups for various purposes, Paine has served the interests of politicians and public figures from opposite camps, some of whom would otherwise have nothing to do with his religious outlook. Presidents George W. Bush and Ronald Reagan both endorsed the author of Common Sense, appropriating the famous sentence, “the cause of America is in a great measure the cause of all mankind” (68). Likewise, Obama, in his first Inaugural speech and after swearing on Lincoln’s Bible, chose to cite Paine, author of The American Crisis. 14Paine remains controversial. He is, however, central to American memory. His political and social views make him relevant and appealing as a powerful reminder of past ideals, at once despite and because of his religious stance—he was a staunch defender of religious freedom, and church and state separation. There are many Lincolns, but there are also many Paines. Paine has been put together with figures like Jefferson and Lincoln, both as a freethinker and as a man of progress, but also with Washington and Jackson, as suggested by “The House I live in,” a patriotic ballad composed in the 1940s and sung by Frank Sinatra hinting at “the words of old Abe Lincoln, of Jefferson and Paine, of Washington and Jackson and the task that still remains.” The connection has enhanced Paine’s cultural elevation. But it has also benefited those who have been associated with Paine, since the connection entails one to a tradition of progress, a tradition with a glorious past and a promising future. 15The name of Paine underwent a revival of interest in the early 2000s. There are many reasons for this, including the bicentenary of his death in 2009. But this must also be linked to the decline of the Christian share of the U.S. population, the sudden awareness that a growing number of Americans no longer identified with a particular religion, and the reactivation of the freethought tradition. The fact that Lincoln has been reconnected to Paine in that context puts forward the possibility of a rehabilitation of that tradition. Cawardine, Richard, Lincoln: A Life of Purpose and Power. New York: Knopf, 2006. Print. Foner, Eric, ed. Our Lincoln: New Perspectives on Lincoln and His World. New York: Norton, 2008. Print. Fox, Richard Wightman. “Lincoln’s Religious Quest. Why his Faith Won’t Suit Either Side in the Culture Wars.” Slate. 18 Jan. 2006. Web. 3 March 2016. Grasso, Christopher. “Skepticism and American Faith: Infidels, Converts, and Religious Doubt in the Early Nineteenth Century,” Journal of the Early Republic 22 (Fall 2002): 456–508. Print. Guelzo, Allen. Abraham Lincoln: Redeemer President. Grand Rapids, MI: Eerdmans, 2002. Print. Herndon, William H., and Jesse W. Weik. Abraham Lincoln: The True Story of a Great Life. Chicago, New York: Applaton, 1889. Gutenberg.org. Web, 17 March 2016. Huberman, Jack. The Quotable Atheist: Ammunition for Non-Believers, Political Junkies, Gadflies, and Those Generally Hell-Bound, New York: Nation Books, 2006. Print. Jacoby, Susan. Freethinkers: A History of Secularism. New York: Metropolitan Books, 2004. Print. Kammen, Michael. Selvages and Biases: The Fabric of History in American Culture. Ithaca, NY: Cornell UP, 1987 . Print. Kazin, Michael. “Under God or Under Citizens: America’s Long Culture War.” New York Times 31 March 2004. Nytimes.com. Web. 17 March 2016. Konner, Joan, The Atheist’s Bible: An Illustrious Collection of Irreverent Thoughts, New York: HarperCollins, 2007. Print. Kosmin, Barry, and Ariela Keysar, with Ryan Cragun and Juhem Navarro-Rivera. American Nones: The Profile of the No Religion Population, Hartford, CT: Institute for the Study of Secularism in Society and Culture, 2009. Print. Kosmin, Barry, and Ariela Keysar. Secularism & Secularity: Contemporary International Perspectives. Hartford, CT: Institute for the Study of Secularism in Society and Culture, 2007. Print. Miller, Richard Lawrence. “I Shall Never Get to the Resting Place.” Free Inquiry 29.1 (2008–2009): 44–48. Print. Paine, Thomas. 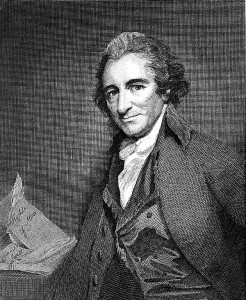 Common Sense: The Writings of Thomas Paine. Ed. Moncure Daniel Conway. Vol. 4. New York: Putnam’s, 1894. New York: AMS Press, 1967. Print. Paine, Thomas. The Age of Reason: The Writings of Thomas Paine. Ed. Moncure Daniel Conway. Vol. 2. New York: Putnam’s, 1893. New York: AMS Press, 1967. Print. Pew Research Center. “Nones” on the Rise. 9 Oct. 2012. Web. 3 March 2016. Remsburg, John R. Abraham Lincoln: Was He a Christian? New York: Truth Seeker, 1893. Print. Trafton, Jennifer. “An Interview with Ronald C. White Jr.” Christianity Today 22 April 2009. Web. 3 March 2016. White, Ronald C. A. Lincoln: A Biography. New York: Random House, 2009. Print. Wills, Garry. “’Strange Gods,’ by Susan Jacoby. New York Times 26 Feb. 2016. Nytimes.com. Web. 17 March 2016. Nathalie Caron is professor of American history at the University of Paris Sorbonne, and the current president of the French Association of American Studies. Recently she guest-edited, with Richard Anker, a special issue of the Revue française d’études américaines on religious transfers (141 ), and co-edited, with Guillaume Marche, La politisation du religieux en modernité (Presses universitaires de Rennes, 2015). She is currently working on the circulation of French radical Enlightenment ideas and works in the early American Republic, more particularly those of d’Holbach and Volney. She is the author of Thomas Paine contre l’imposture des prêtres (Paris: L’Harmattan, 1999). Caron, Nathalie. “Lincoln, Paine and the American Freethought Tradition.” American Studies Journal 60 (2016). Web. 24 Apr. 2019. DOI 10.18422/60-12.